Danish studio Henning Larsen‘s extension to Hotel Tórshavn will be characterised by a cave-like foyer that is a nod to the coastal grottos of the Faroe Islands. The hotel in the island’s capital Tórshavn is being extended by Henning Larsen to help accommodate the increasing numbers of tourists visiting the islands. 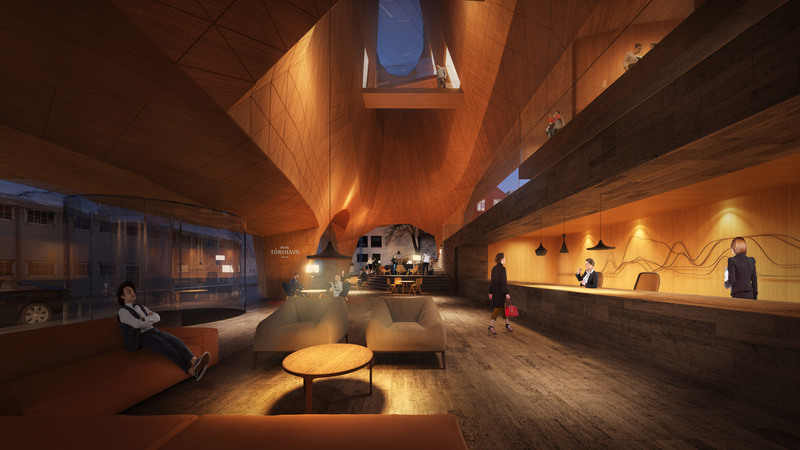 The extension will measure 4,500 square metres and include the introduction of a publicly accessible foyer, which is intended to be a meeting place in the heart of the city. 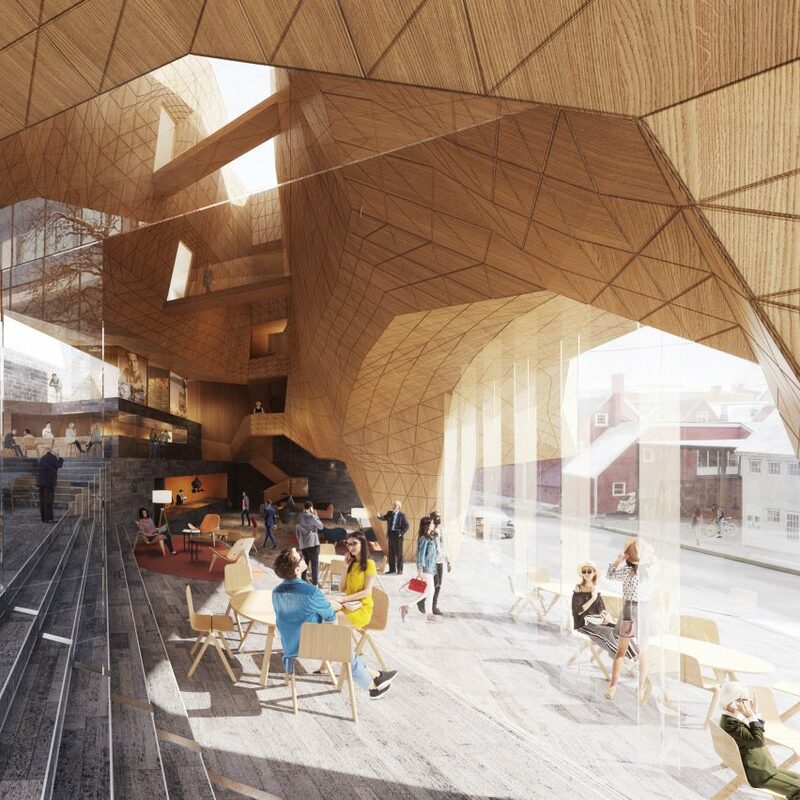 “We’re going back to the original idea of a grand foyer as a way to create street-level identity, and as a passageway for new connections in the city,” explained Osbjørn Jacobsen, Henning Larsen’s Faroese partner Ósbjørn Jacobsen. 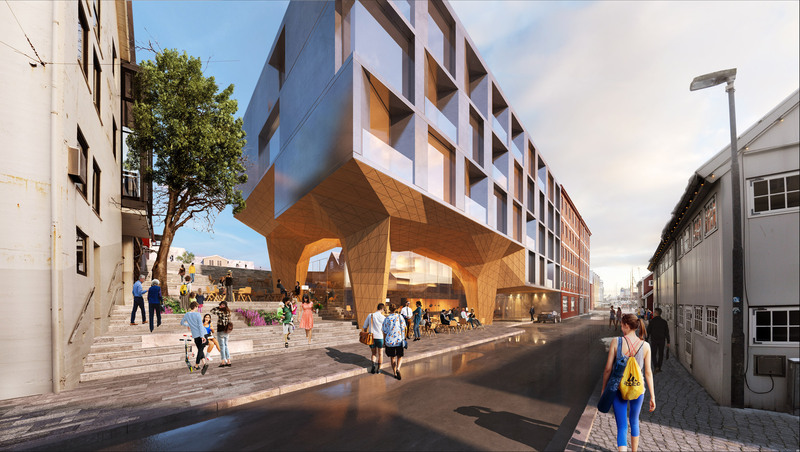 The extension to Hotel Tórshavn will extend over a large concrete staircase, which will connect two of the city centre’s main streets that run either side of the existing hotel. The foyer will be staggered over the staircase, creating a series of split levels inside that will be enclosed by the cave-like walls lined with wooden panels. A void will puncture its roof, bringing light down into the space while overhead walkways connect each side. Above the foyer, the extension will be a new wing for the hotel. It will comprise approximately 100 rooms to boost the city’s “overnight capacity”. 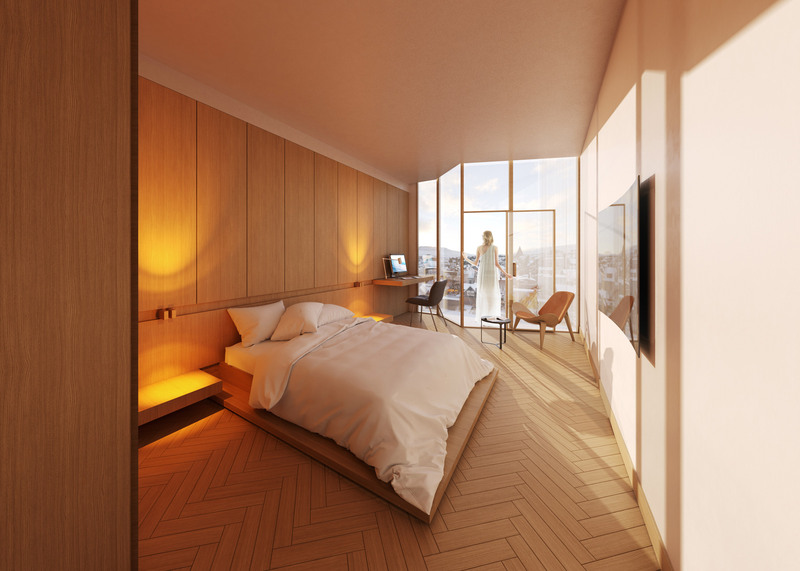 The rooms will be fronted by floor-to-ceiling windows, and characterised by wooden fittings and parquet flooring. The studio also plans to the renovate the existing hotel rooms’ interiors. The Faroe Islands is a self-governing archipelago, comprising 18 volcanic islands located between Iceland and Norway. Henning Larsen’s Hotel Tórshavn expansion responds to the Faroe Islands’ emergence as a international tourist destination. 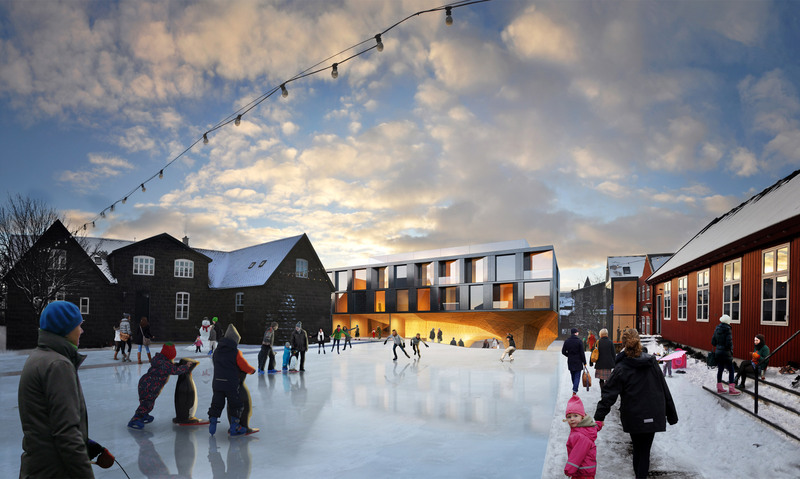 “The design rises as a new landmark in an emerging hotspot, standing as an inviting icon for guests and an active commons for Tórshavn’s locals,” added the studio. Architect Henning Larsen’s eponymously named studio was founded in 1959, famed for its cultural projects including the Harpa Concert and Conference Centre in Reykjavík. The Hotel Tórshavn expansion is not the first project by the studio in the Faroe Islands. It follows the completion of the Eysturkommuna Town Hall in 2018, which that bridges across a river in the small town of Nordragota. 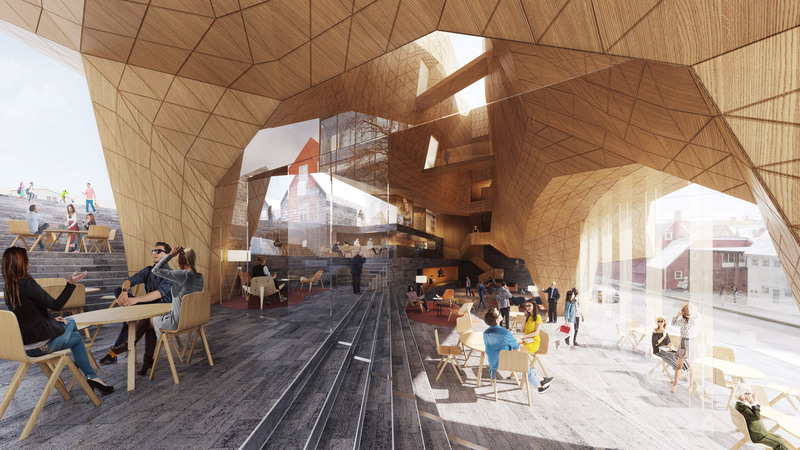 Other recent projects by the studio include the designs for Paris’ largest opera house, housing in Denmark with rollercoaster-like roofs and the completion of Kiruna Town Hall. The post Henning Larsen designs cave-like extension to Hotel Tórshavn in Faroe Islands appeared first on Dezeen.